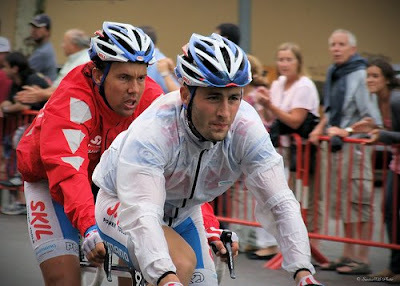 Thanks to sharp-eyed reader Karen, who found this photo on Graham Watson's site of the men who were first and last in the 2009 Tour de France general classification. 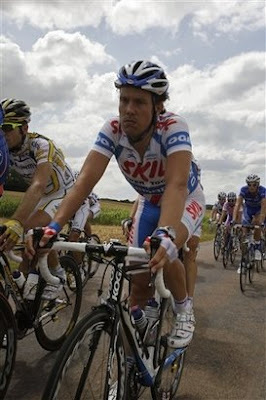 Note the red towel stuck in Hutarovich's helmet signifying the Lanterne Rouge. I thought for a moment he was carrying an electric lantern too but that's a motorcycle headlight showing under his arm. Also study the physiques of these two riders in close to the same position and it becomes abundantly clear why the Lanternes Rouges in the grand tours are most often sprinters: they simply have much more body mass to drag up those mountains. 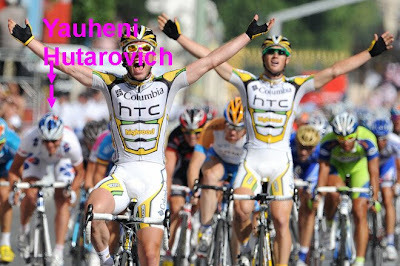 Hutarovich's powerful sprinter's thigh muscles are nearly twice the size of Contador's! Heart-rending clip that makes me really wish that I spoke Dutch. But you don't need to in order to feel his pain. Final finisher Kenny Van Hummel averaged 22.11 mph on his mostly solo ride on today's 128.9-mi mountainous stage. Another reaction to Kenny Robert Van Hummel's intrepid finish is at Podium Cafe. "... You know, Lance Armstrong's first professional race was the 1992 Clasica San Sebastian, where he finished dead last. Just sayin'." I'm sick of people whining about spoilers every time Tour results are obliquely mentioned online. 1. If you want to know what happened in a Tour stage, WATCH THE DAMN STAGE LIVE with all the rest of us. 2. If you don't want to know what happened in a Tour stage, STAY OFF MY DAMNED INTERNET. Kenny Robert Van Hummel makes it a solid 7 days as the Lanterne Rouge today as the main peloton finished in a bunch. A very few stragglers across the line today: Jose Luis Arrieta of Ag2R, Mick Rogers of Columbia (though he was probably delayed by a crash since he was given the time of the main group), and Christophe Riblon of Ag2R. Placements at the top and the bottom of the General Classification may hit the Mixmaster in the next few days, which promises to be interesting. We had four losses today, bringing the peloton down to 166 riders: Romain Feillu of Agritubel; Angelo Furlan of Lampre; and Jérôme Coppel of FdJ all withdrew during the stage, while Rui Alberto Faria Da Costa of Caisse d'Epargne did not start the day. Update: Very nice article today by Daniel Benson in Cyclingnews.com on Kenny Robert Van Hummel. Probably the most boring stage, ever. Ever. A "rest day on wheels". Flat and slow and it went exactly as predicted. Only slower. And no radios. As Phil Liggett said about highlights of the day: "Not quite sure what they were". Our Lanterne Rouge Kenny Robert Van Hummel finished 7th for the stage, but so did everyone else. So he remains in 171st position in the General Classification out of 171 riders still in the peloton. Kurt Asle-Arveson looked badly injured in a crash and it appeared he might not finish, but he did. That is all that happened. Honest. Oooh, that karma will get you every time. Skil-Shimano rider Piet Rooijakkers apparently slugged Mark Cavendish in Stage 3, as Cavendish reported in his Twitters (erroneously identifying the responsible rider). Today Rooijakkers crashed out of the team time trial and departed the Tour de France in an ambulance, bringing the peloton down to 178 riders. The rider who crashed out yesterday, Jurgen Van De Walle of Quick Step, will stay in France another night and returns home tomorrow to Belgium to recuperate. I've been unable to ascertain today's times of those riders who did not finish among the top 5 on their team in the team time trial (when they will get their actual finishing time and not the time of the 5th rider over the line). Alan Perez Lezaun of Euskaltel-Euskadi is still listed as the rider at the bottom of the overall standings today, despite his team's very respectable 10th place finish in the team time trial. Today is the start of what could be one of the most exciting Tours of all time. Here is a nice one-page summary of the route and stages and riders for you to bookmark. Here is the official starter list of all 180 riders. Our early prediction for the Lanterne Rouge of the Stage 1 individual time trial around Monaco? Probably it will be some young mountain goat who is new to the Tour de France. 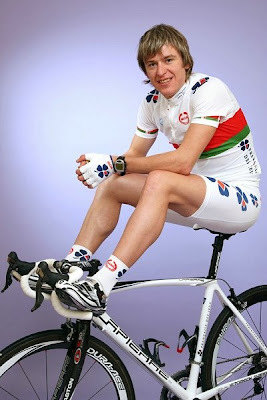 The logical pick, though, is Aleksandr Kuschynski of Liquigas. 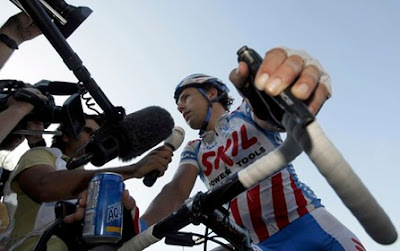 He started the Tour as Lanterne Rouge in both '07 and '08. Who will it be? The one certainty is that it will be someone new, since Wim Vansevenant has retired from professional cycling after his historical threepeat. One blogger says it's going to be Dave Zabriskie. As much as I love the Big Z, I have my doubts that he would stick around to finish the Tour if he weren't helping the team effort and also feeling well enough to be a contender for a stage win in the Stage 18 individual time trial (immediately after leaving the Alps). If he were at the bottom of the General Classification, that would indicate he had some fairly serious problems like crashing and major mountain bonks and solo finishes. What's your guess? Anyone care to make some predictions?